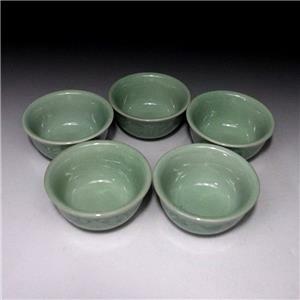 I recently purchased a set of Korean Celadon teacups online. 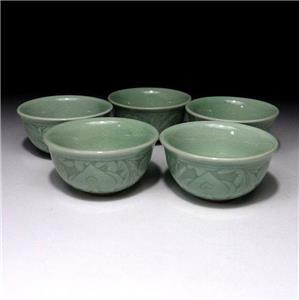 The seller indicated that this 5 teacups were made by Kim Jonmoku Tongoku. 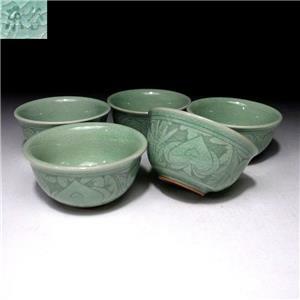 I have no idea about this maker and I would need my Korean readers to give me more input on the maker as well as on Korean celadon. I had noticed that there are many Koreans that enjoy drinking Chinese tea and many of these drinkers do take very nice pictures of their tea and tea ware and posted online especially on Instagram. Do check them out. 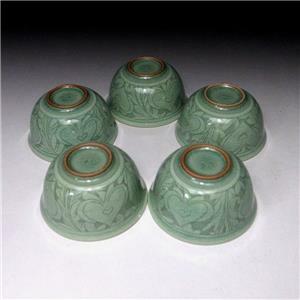 I found these teacups fascinating as the looked like they were made from jade when held against the light. 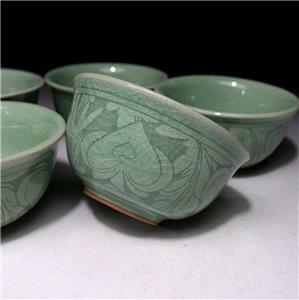 The signature 'cracked' glazed lines seen on the cups gave the impression that these cups were delicately made. I am very fascinated with teacups. I felt that Chinese tea does taste different with different teacups. Lin purion teacups were unique that they held heat very well (the cup stays hot for a long time) and the tea tasted very pronounced in taste and aroma. 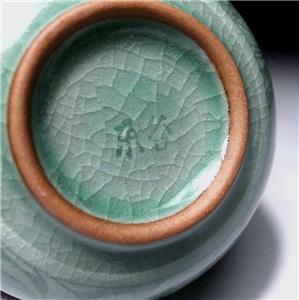 This Korean celadon teacup gave very good results. I gave one of these cups to a collector in Guangzhou and he felt that the tea was 'hua' (smooth) compared to his regular cups. Even a good lady friend that is an expert on coffee, told me that coffee tasted better using older Chinese porcelain cups. Are we mad thinking that teacups would make a difference in the tea? Yes, yes yes . I gave myself a treat opening an old Taetea (aka Dayi) ripe pu erh tea over the Chinese New Year weekend. This is a 100g loose ripe pu erh packed in a paper box. Produced in 1993 (you can see the stamp pressed impression in the 3rd pix), the tea leaves appeared to be small leaf grade. This is one of my oldest pu erh tea in my collection and when I started brewing this tea, I had or was expecting, I don't know, maybe fireworks coming out of my ears or getting seriously tea drunk after the tea session. None of these dramatic effects were present, but instead I was treated to a very comforting pu erh tea session. The tea was very smooth with aromatic old antique wood and herbal scents and the tea glided down the throat easily. 8 very good infusions. But I digress. When you are having a tea session with friends or you are at a teashop sampling tea with 3-4 drinkers present, you can tell whether a tea drinker likes that particular tea - that is - the tea cup empties very fast. You will also observe that the tea drinker will (myself included) be 'looking forward' to each cup of tea. One more thing, when you are at a teashop sampling tea and when you had enough of tea, stop drinking or your teacup will continue to be refilled. Alternatively, you can drink up the tea and tell politely, while returning the empty cup to the host, that you do not want any more refills. I noticed my tea sessions with this Dayi ripe pu erh normally finished in a very short time. I drink this tea fast.